Instead of wasting your money on some weight loss scams, the real thing that will make you lose weight is changing your diet and lifestyle. Losing weight through diet and exercise is the best even though it will take some time. Unfortunately some of us don't have the time to exercise and we have busy schedules that we tend to solicit help from weight loss products. The process of choosing an effective weight loss product can be daunting. 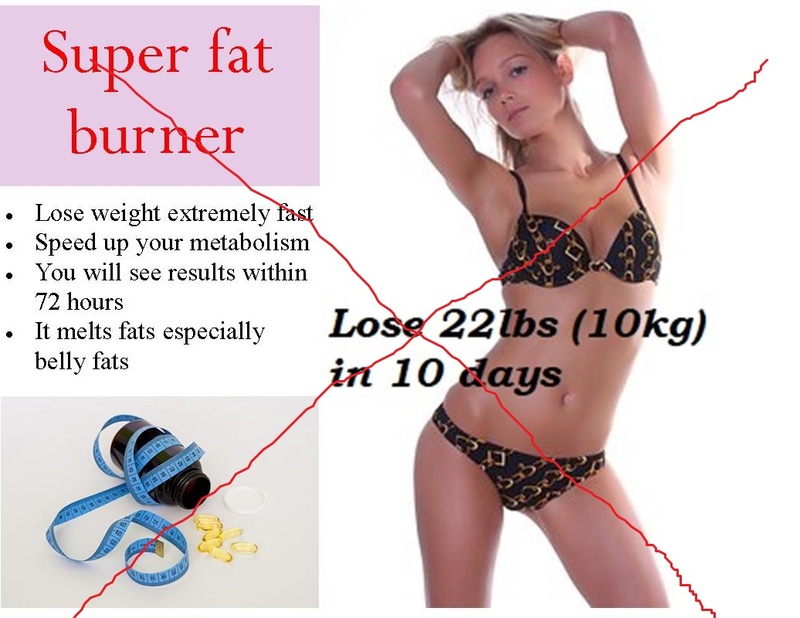 If you are easily gullible, then the weight loss scams will get the best out of you. Even though it is not very necessary, effective weight loss products and supplements can play a big role in your weight loss journey. Here are few tips and tricks on how to identify a weight loss scam. It is unwise to spend your money on instant weight loss schemes, diets and products. We have the 3,500 calorie rule and other recent developments that elaborate on what it takes to gain and lose weight. The 3,500 calorie rule originated from an MD and researcher, Max Wishnofsky in 1958, who calculated that it takes 3,500 calories to burn 1 lb (450 g) of fat (1). Based on this you clearly see that losing 33 pounds (115,500 calories) in 14 days is almost impossible, because it will mean that you lose 8,250 calories per day and an average adult spends 2,500 calories daily. The National Institute of Health has introduced the body weight planner, which is supposed to be more accurate than the 3,500 calorie rule in predicting weight loss (2). Here is another shocking truth, why this type of loss products won't work. Your eating habits and lack of exercise took you to where you are now, it it probably took you months if not years to gain weight. so its only logical and very simple; you have to take the same route that got you overweight to lose weight and that is only by watching your diet and doing some activity. Below are the links to some post teaching you how to use diet and excercise to lose weight. Have you ever seen a weight loss scheme or product with beautiful before and after pictures of weight loss, having lovely testimonies and yet they are not telling you exactly how the product works? And you have to subscribe or make a purchase to discover this "trick". The trick here is you are being played. There is no grand ma's secret, Ancient African secret or hidden Chinese secret that is not centered around nutrition and exercise. The truth hurts but it must be spoken. Don't waste your money on the hypes you see over the internet. The manufacturers are money hungry and are playing over your weakness. If you decide to change your diet and lifestyle, give yourself 1 year and you will see drastic and great changes. This is closely related to the first point above and they go hand in hand. 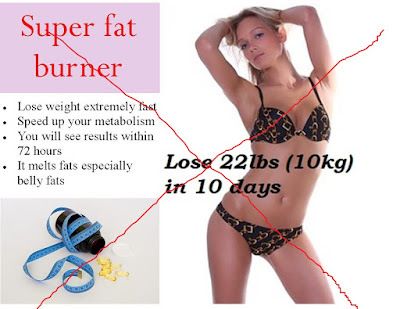 If a product promises you that you will lose 10 pounds in 3 DAYS then you have to watch out. Another common promise is that you will lose fat around a particular area of your body, such as belly, arm or thigh. We have no control over the growth of our body. If we did then i think ladies aspiring to be models could grow an inch taller to qualify. If you are looking for safe, affordable and effective weigh loss products, you can visit WeightWorld and see what they have to offer. Have you ever fallen for a weight loss scam? share your story so that others can learn. 1 Wishnofsky M. Caloric equivalents of gained or lost weight. Am J Clin Nutr. 1958;6(5):542-546.
i fell for a scam product twice. the first i was dumb, thinking i could apply a pomade to reduce belly, arm and thigh fats. The second was a lose weight in 3 days pill.i learned my lesson,watched my diet and the weight loss came as a bonus. I believe real weight loss is not rushed and it is one day at a time. Thats right Andrea, it took us months if not years to gain weight so losing weight in 6 months is perfectly okay. One day at a time is one of the surest and safest ways to lose weight.